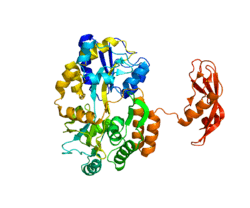 Corticotropin-releasing hormone receptor 1 (CRHR1) is a protein, also known as CRF1, with the latter (CRF1) now being the IUPHAR-recommended name. In humans, CRF1 is encoded by the CRHR1 gene. The corticotropin-releasing hormone receptor binds corticotropin-releasing hormone, a potent mediator of endocrine, autonomic, behavioral, and immune responses to stress. CRF1 receptors in mice mediate ethanol enhancement of GABAergic synaptic transmission. Corticotrophin releasing hormone (CRH) evolved ~500 million years ago in an organism that subsequently gave rise to both chordates and arthropods. The binding site for this was single CRH like receptor. In vertebrates this gene was duplicated leading to the extant CRH1 and CRH2 forms. Additionally four paralogous ligands developed including CRH, urotenin-1/urocortin, urocortin 2 and urocortin 3. Variations in the CRHR1 gene is associated with enhanced response to inhaled corticosteroid therapy in asthma. CRF1 triggers cells to release hormones that are linked to stress and anxiety [original reference missing].Hence CRF1 receptor antagonists are being actively studied as possible treatments for depression and anxiety. Variations in CRHR1 are associated with persistent pulmonary hypertension of the newborn. Corticotropin-releasing hormone receptor 1 has been shown to interact with Corticotropin-releasing hormone and Urocortin. ↑ "Drugs that physically interact with Corticotropin-releasing factor receptor 1 view/edit references on wikidata". ↑ Hauger RL, Grigoriadis DE, Dallman MF, Plotsky PM, Vale WW, Dautzenberg FM (Mar 2003). "International Union of Pharmacology. XXXVI. Current status of the nomenclature for receptors for corticotropin-releasing factor and their ligands". Pharmacological Reviews. 55 (1): 21–6. doi:10.1124/pr.55.1.3. PMID 12615952. ↑ Polymeropoulos MH, Torres R, Yanovski JA, Chandrasekharappa SC, Ledbetter DH (Jul 1995). "The human corticotropin-releasing factor receptor (CRHR) gene maps to chromosome 17q12-q22". Genomics. 28 (1): 123–4. doi:10.1006/geno.1995.1118. PMID 7590738. ↑ Chen R, Lewis KA, Perrin MH, Vale WW (Oct 1993). "Expression cloning of a human corticotropin-releasing-factor receptor". Proceedings of the National Academy of Sciences of the United States of America. 90 (19): 8967–71. doi:10.1073/pnas.90.19.8967. PMC 47482 . PMID 7692441. ↑ "Entrez Gene: CRHR1 corticotropin releasing hormone receptor 1". ↑ Nie Z, Schweitzer P, Roberts AJ, Madamba SG, Moore SD, Siggins GR (Mar 2004). "Ethanol augments GABAergic transmission in the central amygdala via CRF1 receptors". Science. 303 (5663): 1512–4. doi:10.1126/science.1092550. PMID 15001778. ↑ Tantisira KG, Lake S, Silverman ES, Palmer LJ, Lazarus R, Silverman EK, Liggett SB, Gelfand EW, Rosenwasser LJ, Richter B, Israel E, Wechsler M, Gabriel S, Altshuler D, Lander E, Drazen J, Weiss ST (Jul 2004). "Corticosteroid pharmacogenetics: association of sequence variants in CRHR1 with improved lung function in asthmatics treated with inhaled corticosteroids". Human Molecular Genetics. 13 (13): 1353–9. doi:10.1093/hmg/ddh149. PMID 15128701. ↑ Kehne JH (Jun 2007). "The CRF1 receptor, a novel target for the treatment of depression, anxiety, and stress-related disorders". CNS & Neurological Disorders Drug Targets. 6 (3): 163–82. doi:10.2174/187152707780619344. PMID 17511614. ↑ Ising M, Holsboer F (Dec 2007). "CRH-sub-1 receptor antagonists for the treatment of depression and anxiety". Experimental and Clinical Psychopharmacology. 15 (6): 519–28. doi:10.1037/1064-1297.15.6.519. PMID 18179304. ↑ Byers HM, Dagle JM, Klein JM, Ryckman KK, McDonald EL, Murray JC, Borowski KS (Feb 2012). "Variations in CRHR1 are associated with persistent pulmonary hypertension of the newborn". Pediatric Research. 71 (2): 162–7. doi:10.1038/pr.2011.24. PMID 22258127. ↑ Grammatopoulos DK, Dai Y, Randeva HS, Levine MA, Karteris E, Easton AJ, Hillhouse EW (Dec 1999). "A novel spliced variant of the type 1 corticotropin-releasing hormone receptor with a deletion in the seventh transmembrane domain present in the human pregnant term myometrium and fetal membranes". Molecular Endocrinology. 13 (12): 2189–202. doi:10.1210/me.13.12.2189. PMID 10598591. ↑ Gottowik J, Goetschy V, Henriot S, Kitas E, Fluhman B, Clerc RG, Moreau JL, Monsma FJ, Kilpatrick GJ (Oct 1997). "Labelling of CRF1 and CRF2 receptors using the novel radioligand, [3H]-urocortin". Neuropharmacology. 36 (10): 1439–46. doi:10.1016/S0028-3908(97)00098-1. PMID 9423932. ↑ Donaldson CJ, Sutton SW, Perrin MH, Corrigan AZ, Lewis KA, Rivier JE, Vaughan JM, Vale WW (May 1996). "Cloning and characterization of human urocortin". Endocrinology. 137 (5): 2167–70. doi:10.1210/en.137.5.2167. PMID 8612563. Taché Y, Martinez V, Wang L, Million M (Apr 2004). "CRF1 receptor signaling pathways are involved in stress-related alterations of colonic function and viscerosensitivity: implications for irritable bowel syndrome". British Journal of Pharmacology. 141 (8): 1321–30. doi:10.1038/sj.bjp.0705760. PMC 1574904 . PMID 15100165. McLean M, Bisits A, Davies J, Woods R, Lowry P, Smith R (May 1995). "A placental clock controlling the length of human pregnancy". Nature Medicine. 1 (5): 460–3. doi:10.1038/nm0595-460. PMID 7585095. Polymeropoulos MH, Torres R, Yanovski JA, Chandrasekharappa SC, Ledbetter DH (Jul 1995). "The human corticotropin-releasing factor receptor (CRHR) gene maps to chromosome 17q12-q22". Genomics. 28 (1): 123–4. doi:10.1006/geno.1995.1118. PMID 7590738. Chen R, Lewis KA, Perrin MH, Vale WW (Oct 1993). "Expression cloning of a human corticotropin-releasing-factor receptor". Proceedings of the National Academy of Sciences of the United States of America. 90 (19): 8967–71. doi:10.1073/pnas.90.19.8967. PMC 47482 . PMID 7692441. Ross PC, Kostas CM, Ramabhadran TV (Dec 1994). "A variant of the human corticotropin-releasing factor (CRF) receptor: cloning, expression and pharmacology". Biochemical and Biophysical Research Communications. 205 (3): 1836–42. doi:10.1006/bbrc.1994.2884. PMID 7811272. Opdenakker G, Fiten P, Nys G, Froyen G, Van Roy N, Speleman F, Laureys G, Van Damme J (May 1994). "The human MCP-3 gene (SCYA7): cloning, sequence analysis, and assignment to the C-C chemokine gene cluster on chromosome 17q11.2-q12". Genomics. 21 (2): 403–8. doi:10.1006/geno.1994.1283. PMID 7916328. Vita N, Laurent P, Lefort S, Chalon P, Lelias JM, Kaghad M, Le Fur G, Caput D, Ferrara P (Nov 1993). "Primary structure and functional expression of mouse pituitary and human brain corticotrophin releasing factor receptors". FEBS Letters. 335 (1): 1–5. doi:10.1016/0014-5793(93)80427-V. PMID 8243652. Donaldson CJ, Sutton SW, Perrin MH, Corrigan AZ, Lewis KA, Rivier JE, Vaughan JM, Vale WW (May 1996). "Cloning and characterization of human urocortin". Endocrinology. 137 (5): 2167–70. doi:10.1210/en.137.5.2167. PMID 8612563. Liaw CW, Grigoriadis DE, Lovenberg TW, De Souza EB, Maki RA (Jun 1997). "Localization of ligand-binding domains of human corticotropin-releasing factor receptor: a chimeric receptor approach". Molecular Endocrinology. 11 (7): 980–5. doi:10.1210/me.11.7.980. PMID 9178757. Asakura H, Zwain IH, Yen SS (Aug 1997). "Expression of genes encoding corticotropin-releasing factor (CRF), type 1 CRF receptor, and CRF-binding protein and localization of the gene products in the human ovary". The Journal of Clinical Endocrinology and Metabolism. 82 (8): 2720–5. doi:10.1210/jc.82.8.2720. PMID 9253360. Gottowik J, Goetschy V, Henriot S, Kitas E, Fluhman B, Clerc RG, Moreau JL, Monsma FJ, Kilpatrick GJ (Oct 1997). "Labelling of CRF1 and CRF2 receptors using the novel radioligand, [3H]-urocortin". Neuropharmacology. 36 (10): 1439–46. doi:10.1016/S0028-3908(97)00098-1. PMID 9423932. Grammatopoulos D, Dai Y, Chen J, Karteris E, Papadopoulou N, Easton AJ, Hillhouse EW (Jul 1998). "Human corticotropin-releasing hormone receptor: differences in subtype expression between pregnant and nonpregnant myometria". The Journal of Clinical Endocrinology and Metabolism. 83 (7): 2539–44. doi:10.1210/jc.83.7.2539. PMID 9661640. Sakai K, Yamada M, Horiba N, Wakui M, Demura H, Suda T (Sep 1998). "The genomic organization of the human corticotropin-releasing factor type-1 receptor". Gene. 219 (1-2): 125–30. doi:10.1016/S0378-1119(98)00322-9. PMID 9757017. Grammatopoulos DK, Dai Y, Randeva HS, Levine MA, Karteris E, Easton AJ, Hillhouse EW (Dec 1999). "A novel spliced variant of the type 1 corticotropin-releasing hormone receptor with a deletion in the seventh transmembrane domain present in the human pregnant term myometrium and fetal membranes". Molecular Endocrinology. 13 (12): 2189–202. doi:10.1210/me.13.12.2189. PMID 10598591. Lewis K, Li C, Perrin MH, Blount A, Kunitake K, Donaldson C, Vaughan J, Reyes TM, Gulyas J, Fischer W, Bilezikjian L, Rivier J, Sawchenko PE, Vale WW (Jun 2001). "Identification of urocortin III, an additional member of the corticotropin-releasing factor (CRF) family with high affinity for the CRF2 receptor". Proceedings of the National Academy of Sciences of the United States of America. 98 (13): 7570–5. doi:10.1073/pnas.121165198. PMC 34709 . PMID 11416224. Perrin MH, Fischer WH, Kunitake KS, Craig AG, Koerber SC, Cervini LA, Rivier JE, Groppe JC, Greenwald J, Møller Nielsen S, Vale WW (Aug 2001). "Expression, purification, and characterization of a soluble form of the first extracellular domain of the human type 1 corticotropin releasing factor receptor". The Journal of Biological Chemistry. 276 (34): 31528–34. doi:10.1074/jbc.M101838200. PMID 11425856. Pisarchik A, Slominski AT (Dec 2001). "Alternative splicing of CRH-R1 receptors in human and mouse skin: identification of new variants and their differential expression". FASEB Journal. 15 (14): 2754–6. doi:10.1096/fj.01-0487fje. PMID 11606483. Graziani G, Tentori L, Portarena I, Barbarino M, Tringali G, Pozzoli G, Navarra P (Mar 2002). "CRH inhibits cell growth of human endometrial adenocarcinoma cells via CRH-receptor 1-mediated activation of cAMP-PKA pathway". Endocrinology. 143 (3): 807–13. doi:10.1210/en.143.3.807. PMID 11861501. King JS, Bishop GA (Dec 2002). "The distribution and cellular localization of CRF-R1 in the vermis of the postnatal mouse cerebellum". Experimental Neurology. 178 (2): 175–85. doi:10.1006/exnr.2002.8052. PMID 12504877. "Corticotropin-releasing Factor Receptors: CRF1". IUPHAR Database of Receptors and Ion Channels. International Union of Basic and Clinical Pharmacology.